Community Groups meeting at Wereham Village Hall. 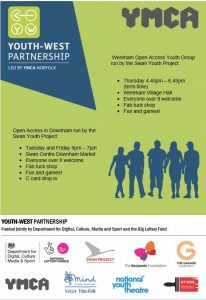 Click here to see information about Local Wereham Activities. We are a group of crafters, not everybody makes things, some just come for the social! We make and sell crafts to raise money for the village hall and other worthwhile charities. We meet up once a month for a get together and a natter along with the compulsory tea, coffee and cake. Apart from that we all work in our own homes at our own pace with whatever craft we do. New crafters will always be welcome especially if your craft is something other than knitting or sewing, guest speaker / demonstrators are welcome and enjoyed, so please do get in touch. We meet once a month on a Monday night in the community room at 7-30 . Group of friendly fundraising volunteers who meet to discuss new ideas and organise events to raise funds for the village hall. New members welcome to pop in or to add yourself to the ‘Friends of’ email list for updates on coming events, help needed and dates of the next meeting. Meet monthly, please click here to go to the Heritage Page. Thursday evenings, bi-monthly in the hall. 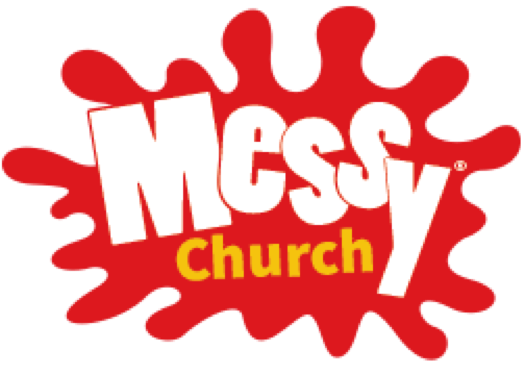 Messy Church is a member of the world wide Messy Church group. It’s for everyone in Wereham and local villages who wish to take part in a very family friendly worship. It is held every 2 months on a Thursday evening 4-6pm. Starts in St Margaret’s church where children often lead part of the service with readings and playing musical instruments. Continues in the village hall where we do craft type activities related to the theme of the day. Finishes with a shared meal for all, sometimes hot dogs, pizza, sausage and chips, picnic foods etc. Is free to all, donations for the church are welcomed. 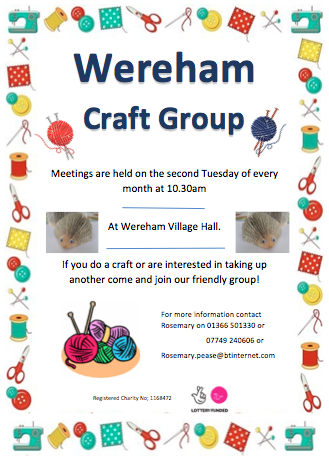 Each event is carefully planned by a dedicated group of Wereham villagers. Open to all. Everyone is welcome. Wereham Neighbourhood Watch AGM in the hall annually in March in the community room. St Margaret’s Church, dedicated to St Margaret of Antioch, is a medieval Grade II* listed church in the centre of the village of Wereham. The parochial church council meets 6 times a year and has an annual meeting which is open to everyone. The village hall often hosts church meetings including, The Harvest supper, cafe type facilities for Open Gardens, one of the main fundraising activities, and for the regular Messy church events. Everyone is warmly welcomed to all events and meetings. We meet on a Thursday afternoon at 2pm until 4pm during the Winter. 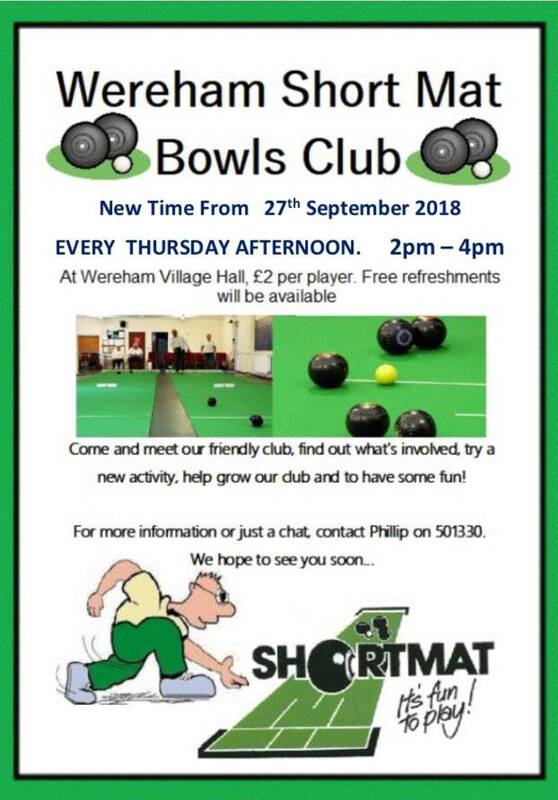 We play for the enjoyment of it and we are a very happy and welcoming group of people with lots of joking going on throughout the afternoon the cost is £2.00 per player, spectators are free and tea or coffee and biscuits are served during the afternoon. We will always welcome new players, please come along and give us a look to see what you think. New Social Group. Details to follow. Large assortment of toys and play equipment. This session is for 0-5 year olds. 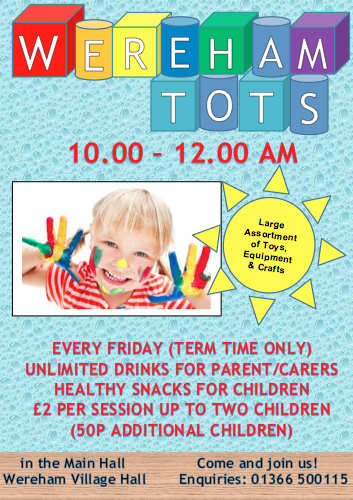 £2 per session for up to two children (50p additional children), Price includes unlimited drinks for parent/carers, drinks and a healthy snack for children. 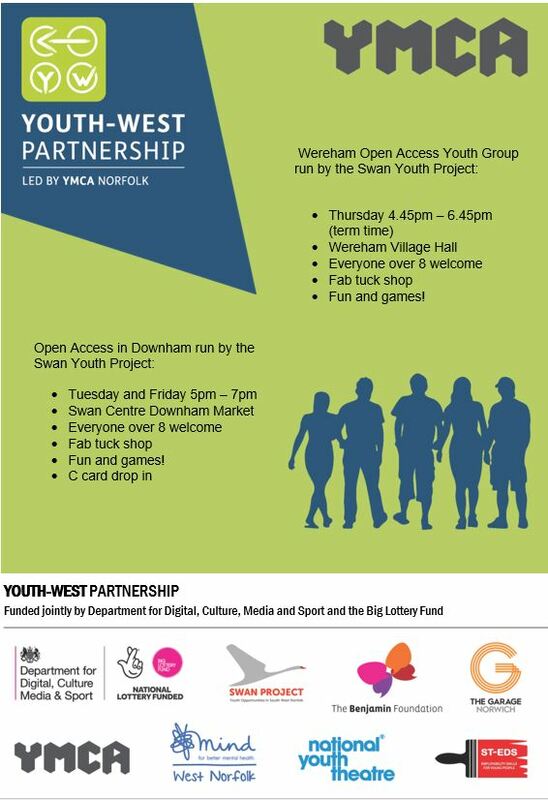 The SWAN project is excited to start a free youth group for ages 8+ @ Wereham village hall, 4.45-6.45 pm every week term time only. Come along we have loads to offer! FUN – lots of activities and games running each week!! !